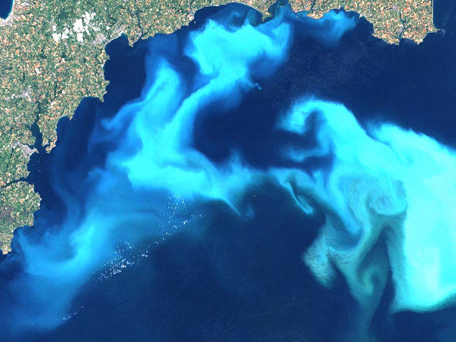 Coccolithophoridés prospers mainly in the slice of superior water (until 50m in tropical waters) and particularly in the plankton. Still present today, these seaweeds give rise occasionally to a called exceptional proliferation bloom or a blooming phytoplanctonique appearing in turquoise blue color since the space. During all their life, thus Coccolithophoridés "pèlent" their coccolithes which fall on the bottom and accumulate to train a mud at the origin of the chalk. The agglutination of coccolithes under forms of balls has to contribute to accelerate the settling. Next to these dominant nannofossiles, he exists in proportion variable of the other bigger fossil fragments: foraminifères, calcisphères, bryozoaires, brachiopodes, bivalves in particular prisms of inocérames, sea urchins, crinoïdes, astéries, toweling, teeth of sharks, etc. These biodetrital elements can have split up and put down on the spot or then have been transported and concentrated in the form of placers. Either in mm / century (mm 102A) In touch with the human life expectancy; it is about 2 mm / century. This rather high rate of sedimentation for a calcareous rock is bound to the strong productivity, to the absence of dissolution under a low depth and to the very low ratio Mg / Ca of the sea water. Coccolithe: from Greek?????? "Pip"????? "Stone"